When working on anything electronic you want to make sure you take precautions against static electricity and ESD (electrostatic discharge) from damaging your work. ESD is based on the fact that people and things are made of electrons. When these electrons become static on our skin and clothes they can accumulate charge and when they ae near another object a destructive transfer of electrons (electrostatic discharge) potentially can take place. Electrons become static primarily because of the triboelectric effect: the transfer of electrons that takes place when two objects come into contact with each other. Insulators like carpets, plastics, and wood – although they keep our homes and offices warm- are all considered by static control professionals to be potential sources of static electricity and ESD. Since insulators can hold multiple positive and negative charges in pockets across their surface there is no safe way to eliminate them other than to keep our distance from them or to cover them if they are part of a flat surface. For example, if we are using a wood table we would want to cover that with an anti static mat. If we have plastic shelving, we would want to replace it with metal shelving or cover the shelves with anti static matting. If you are using carpeted floors you probably are going to have the rip the carpet out. Instead of working on top of insulators, electronics manufacturers use anti static mats that are static dissipative. Static Dissipative is defined in ohms resistance to charging. Anything less than 1 x 10e6 ohms is considered Conductive. Anything above 1x10e12 ohms is considered insulative. Anything between these two points is considered static dissipative. 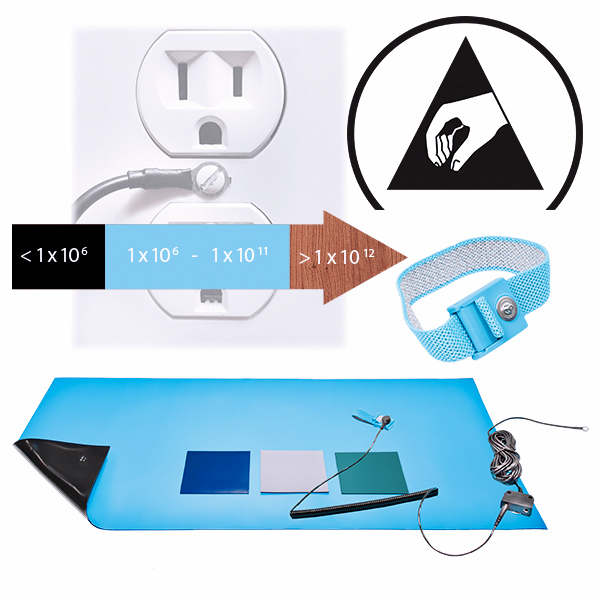 However, the ESD Association recommends that an anti static mat has surface resistance on its top side between 1 megohm (1 x 10e6 ohms) and 1 gigohm (1 x 10e9 ohms). The bottom side of an anti static mat that is black is the bottom conductive part. While the top side is static dissipative, the bottom side can be conductive. In fact, since most electronics manufacturers use metal shelving and grounded floors they prefer that the bottom side is conductive so that there is no electrical barrier between the grounded (metal) shelving and the mat being used as shelf liner. If the matting is being used as shelf liner laying on top of a wood shelf without connection to an electrical ground it would be considered isolated- (a potential source of ESD). Whether you are using a metal table or wood table underneath the anti static mat you will want to give static electricity a dedicated path from the mat into an electrical ground when you are using it as a work surface. This is accomplished by connecting a grounding cable to the mat via using metal snaps. Grounding Cables come in several different types. There are grounds for wrist straps, mats, “common point” grounds, and monitors. The Grounding Cable is what connects the anti static mat being used as a work surface to the electrical outlet. The difference between using grounding cables separate for a mat or wrist strap as opposed to a common point ground is primarily ergonomic. However, having the mat and the wrist strap grounded at the same point does keep them in electrical balance. Next post: How Do Shoe Grounders Work?